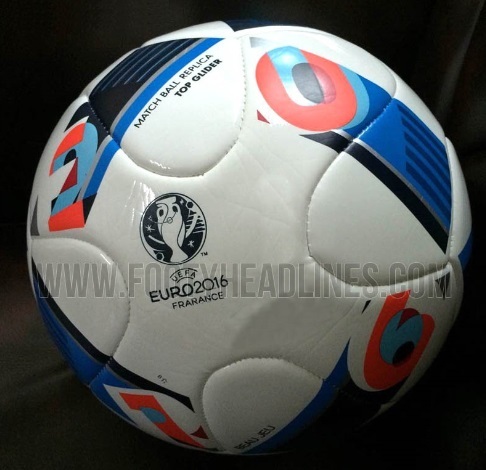 This is the all new Euro 2016 ball which will be used in next years marquee international football competition in europe. The ball is mainly white with blue/red/black of different shades designs across the ball. The UEFA Euro 2016 logo comes in dark colours . As far as the ball design is concerned Adidas did not make much changse in the ball panel so from the leaked images it looks like the ball panel design and technical stuff is pretty much the same like Barzuca Ball which was used in 2014 world cup. Official Euro 2016 match ball will be revealed on the day of the finals draw on 12 december 2015, we will update the post when the official release has been made. The new ball will be priced at around 150 euros on official adidas outlets and it will hit the stores in december 2015. Pakistan company “Forward Sports” got the contract to produce FIFA World Cup 2014 balls from Adidas on mass level which were used in the official competition and we can expect the same with Euro 2016 as well.